Saga and the AA, the private-equity owned businesses that are merging, incurred no liability for corporation tax last year, the BBC can disclose. And in their two-and-a-half years of ownership by private equity, they paid almost zero corporation tax. In the same period, the private equity owners of these businesses - Permira, CVC and Charterhouse - generated gains for themselves of £2.5bn. This is about three-and-a-half times the value of their initial investment. Partners in the top private equity firms are likely to be questioned about this on Tuesday, when they are interrogated by MPs on the Treasury Select Committee. The MPs will have an opportunity to grill a partner of CVC, one of the firms that controls the AA. Saga, which sells holidays and other products to the over-50s, announced its merger with motoring giant AA last month. The deal values the combined firm at about £6.15bn, creating a company with more than 11,000 employees. Private equity firms Permira and CVC bought the AA for £1.7bn in 2004. But the deal proved controversial, after the firm cut 3,000 jobs and union officials criticised the merger. And Labour committee chairman John McFall told the BBC that the revelation that the firms had such low tax bills was a cause for concern. "The question is, are the private equity companies using debt as equity?" he said. "If they are, then they are distorting the system. These are questions that are still to be answered." However, in a statement to the BBC, Saga said that it was treated the same as any other UK company. "All companies that borrow money can deduct interest from their taxable profits. "The economy benefits because banks which receive that interest are subject to corporation tax. "Saga has grown substantially under private equity and makes a valuable contribution to the UK economy in terms of jobs and services," the company said. The way that private equity owners reduce the tax payable by the businesses they buy is highly contentious. They inject huge debts into their companies, and the interest paid on these borrowings wipes out all taxable profit - thereby minimising liability to tax. And there are concerns that the trend towards private equity ownership of companies will significantly reduce the flow of corporation tax to the exchequer. The AA's accounts show that it ended both 2005 and 2006 with the taxman actually owing it money - £67.9m and £11.9m. 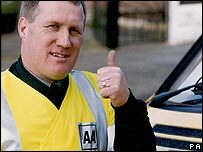 However in 2006, the AA made an operating profit of £252m, which was 29% higher than in the previous year. Almost all this profit was wiped out by £222.3m "finance costs" on its £1.7bn of debts. Saga has not yet filed its accounts for the year to 31 January 2007. But the company has disclosed to the BBC that it incurred a zero liability for corporation tax in that year. The finance, travel and publishing group made a profit before interest, tax, depreciation and amortisation - or EBITDA - of almost £160m in those 12 months, but this will have been eliminated by the interest charges on its borrowings of £1.6bn. Saga's accounts for the previous year to 31 January 2006 show that it incurred a tax liability of £6.3m, which is minimal in comparison with an operating profit of £93m. After interest charges of £204m, it made a loss before tax in 2005/6 of £111m. Private equity partners tend to argue that all they do is transfer the liability for tax to those institutions that lend money to their companies. But in a globalised financial world, many of these providers of debt are domiciled outside the UK, and do not pay tax here (if they pay tax at all). In the case of the AA and Saga, the exchequer will recoup some revenue in the form of capital gains tax on the £2.5bn of capital appreciation on the businesses. Again, many of the owners of the AA and Saga - whether the investors in the private equity firms' funds or the partners in those firms - pay tax outside the UK. And among those that pay British tax, some will pay the reduced capital gains tax rate of 10%, which is far lower than the corporation tax rate of 30%.